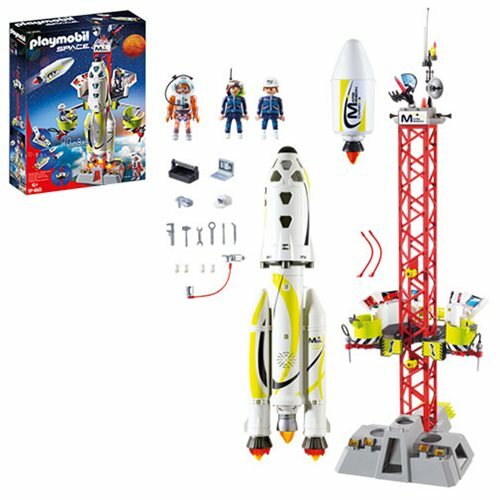 Blast off at the Playmobil 9488 Mission Rocket with Launch Site! This set comes complete with space capsule. With astronauts, maintenance platform, and functioning lights and sounds (2 x "AA" batteries required.) Combine this set with the Mars Space station and Satellite Meteoroid Laser (9487 and 9490 - each sold separately) for added fun! Stands 28-inches tall when fully assembled. Includes tower, capsule, booster, computers, tools, 3 figures, and a lot of stuff for interplanetary fun.